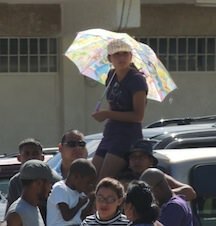 A woman waits for the Settlement Day parade to begin. The event started about an hour and a half after its scheduled time. On a whim, I went to Dangriga, Belize. This is a sleepy town that isn’t much bigger than my hometown of Haysville, Kansas. But Dangriga is a major city in Belize. Haysville was a suburb. Dangriga was buzzing with excitement from the moment I arrived. Several Belizean tourists were in town for Settlement Day, a holiday in the Stann Creek and Toledo districts of the country. 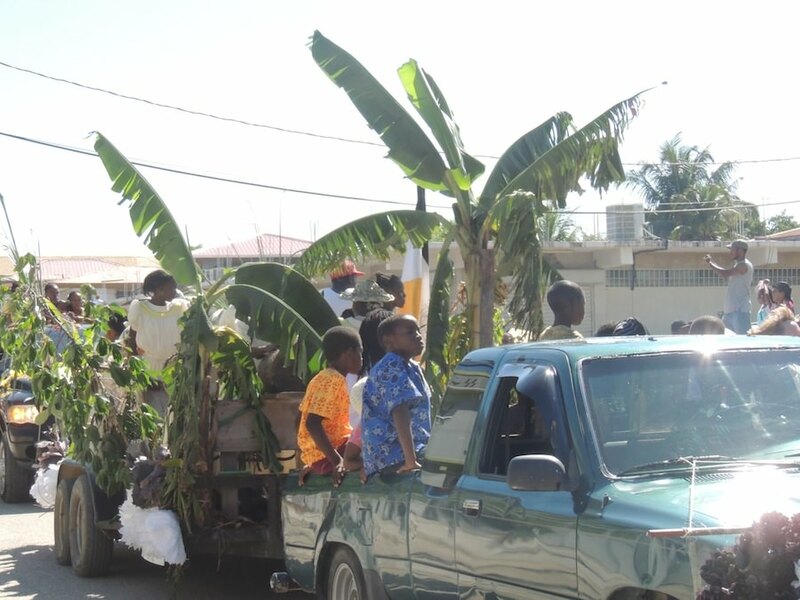 Settlement Day celebrates the day the Garifuna arrived in Belize. For one week, the people in Stann Creek and Toledo engage in massive amounts of partying. On the 18th of November, I ventured out into Dangriga with an English couple, John and Christine, who had just became newly engaged. Our night began just a few blocks away from our hotel. On the south side of the creek, a crowd had formed around a group of Garifuna drummers. John, Christine and I heard the steady rhythm of the beat. A person playing maracas joined, and then faintly underneath, we heard the harmony riff of a saxophone. After five minutes, we decided to see what else we could find. We walked to a market area and met a Belizean named Harry. I’m not sure if that was his name, but he kept comparing himself to the English prince. Picture a 50-something man with gray hair, a moustache, an open shirt and a touch-feely attitude. That was Harry. A man walks down St. Vincent Street. 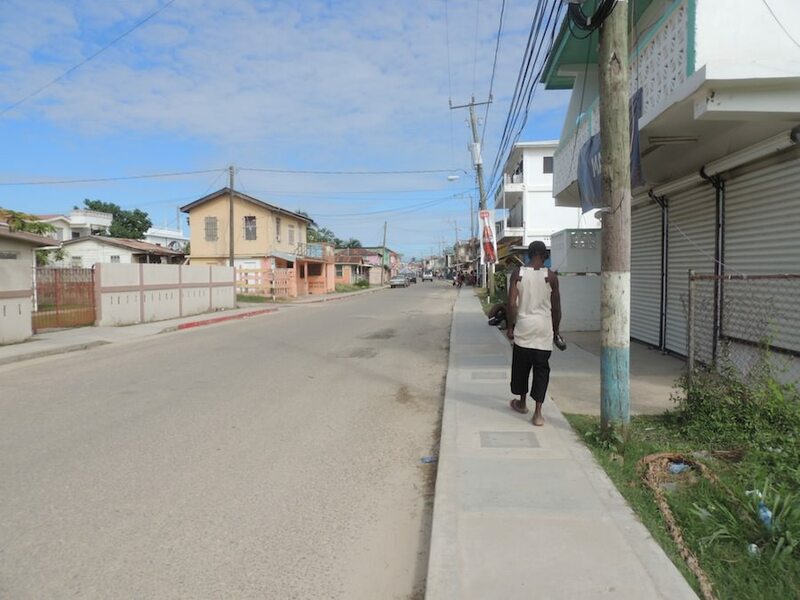 This is the southern portion of Dangriga’s main street, pre-festivities. Harry took a liking to John right away and didn’t necessarily get the hint that we weren’t interested in talking with him. Eventually, I signaled to John and Christine that I wanted some food. We excused ourselves and walked to a food stand. That’s where I ordered some of the most delicious jerk pork I’ve had in my life. As I savored the flavor of the pork, Harry came up and started talking again. And that’s where his true agenda came forward. “Could you please give me a dollar?” he asked. We declined to give him money and moved on to a park where a crowd was watching masked dancers. There was no narration, but it seemed that a person was attempting to tame a bull. John, Christine and I grew bored. I called it a night and let them spend the rest of the evening alone. A drummer laughs after I asked him to do a demonstration. 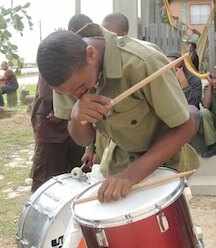 He is a member of the Belize Defence Force. When I awoke at my hotel, it was 6:30 a.m. There was still time to catch the ships that were reenacting the moment when the Garifuna arrived in Belize. But I decided not to go. It was too early for me, and I was quite glad in hindsight that I didn’t go. John and Christine said it wasn’t worth it. I believe them. However, I did venture out at 7 a.m. for breakfast. I ended up at Riverside Café for a second time. This was not the same restaurant that I had eaten at the day before. Instead, the restaurant was in bar mode. A crowd of people packed the place, and they were serving beers like a club on Friday night. I pushed my way through the crowd to order a coffee, and a tall Belizean man in a red shirt decided that he was going to be my friend. One thing that I’ve noticed while traveling in Belize is that locals who befriend me have an ulterior motive. I’m not sure what this man wanted, but I know it wasn’t innocent. Obviously, this set off alarm bells, but I tend to keep a straight face unless I’m with friends. He told me to order some light beer for him, but then proceeded to try and get me a coffee. When I was served hot water instead, I turned to the door and walked out. That’s when Red Shirt decided to follow me. “Let’s go this way,” he said as we walked out the door. This is the one of the few times that I’m grateful for being short. I darted into the crowd and zig zagged my way to the bridge. As I was crossing, I looked over my shoulder. I didn’t see Red Shirt, so I knew I was in the clear. I ventured over to a breakfast place just across the river and ordered some eggs, toast and beans. I noticed a group of travlers and said “hello.” This is how I met Shane from Australia and Jenny from South Carolina. They had stayed up all night like the Belizeans and watched the boats come in. But for being awake for 24 hours, they were functioning quite well. We made plans to hang out at noon when the festivities were supposed to start. I walked back to my hostel, grabbed my camera and went to the park nearby. Band members were already practicing for the parade. 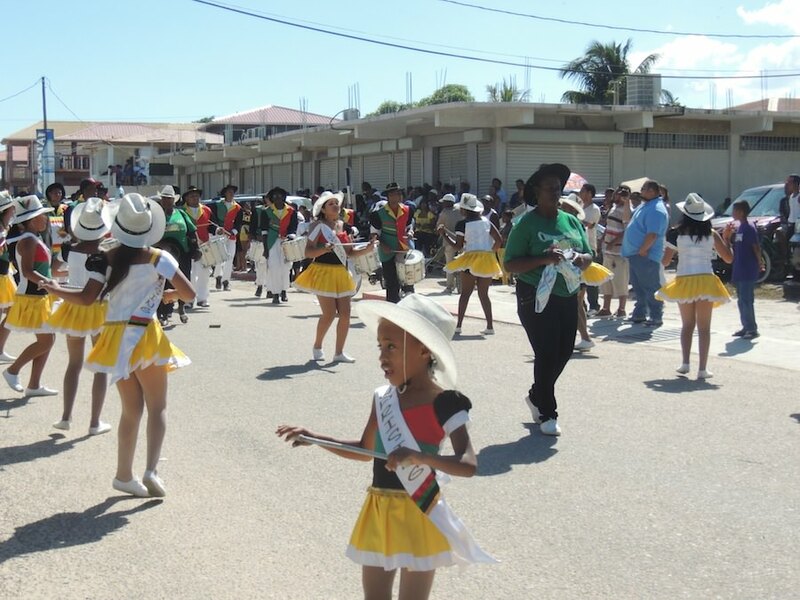 Dancers on St. Vincent Street, Dangriga, Belize. But I grew restless. I wandered over to the main street and ran into Shane, Jenny and a new Australian named Ben. 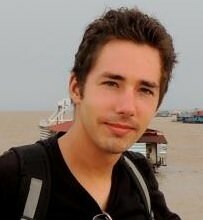 This was a man who had spent the majority of his adult live traveling. His long hair and beard certainly added to the hippie vibe he was already giving. Jenny and Shane wanted to go swimming, but Ben and I convinced them to wait for the parade. About an hour and a half later, the event finally started. The bands marched behind trucks playing songs. Between them, floats would hand out samples of free rum, which Ben and I gladly accepted. Trucks drove by with palm trees. Some of the people inside handed out T-shirts or beads. Others handed out rum. At this point, the parade was “officially” over with a float blasting rap music. But locals and tourists weren’t ready to end. They followed the float and danced behind it for several minutes. Ben disappeared into the crowd. The rest of our group followed on the sidewalks and acted more like observers. After a half hour, the crowd stopped at the bridge and our group split ways. Twenty-four hours later, Dangriga had completely changed. The market on the north side of the creek was gone. The nightly buzz of the town vanished. Instead, I heard nothing. Peace and quiet. This is the “real” Dangriga. Disclaimer: Some names were changed in this article. Did you stay at Ruthie’s Cabanas? I was there in 2008 and Ruthie and her husband, Mito, were great. During xmas week, the Drummers came to Ruthie’s and we had a personal serenade in the yard. I never ate at any sit down places there. Ruthie fed me or I ate from the taco lady on the street. Dangriga is the opposite of Caye Caulker or Placencia. It is a bit more edgy. No, I stayed at the Chaleanor Hotel for three nights and Val’s the last night. Aside from my Honduran neighbors singing Justin Bieber all night long, the stay was pleasant. I never felt unsafe in Dangriga, but you’re right. It does have a different vibe than Caye Caulker (or San Ignacio where I’m staying now). I don’t know if I’ll go back, but I’m definitely going to check out Hopkins and Punta Gorda the next time I’m in Belize.